Ludwig ‘Mies’ Van Der Rohe is famous, amongst many things, for giving us the phrase “less is more”. And, after stepping into the living room of the recently restored Villa Tugendhat, I suspect he wasn’t thinking about size or budget when he uttered the design world’s most famous quote. The villa built in 1928 and one of the heaviest hitters of all modernist buildings is a long, long way from being a socialist’s dream. 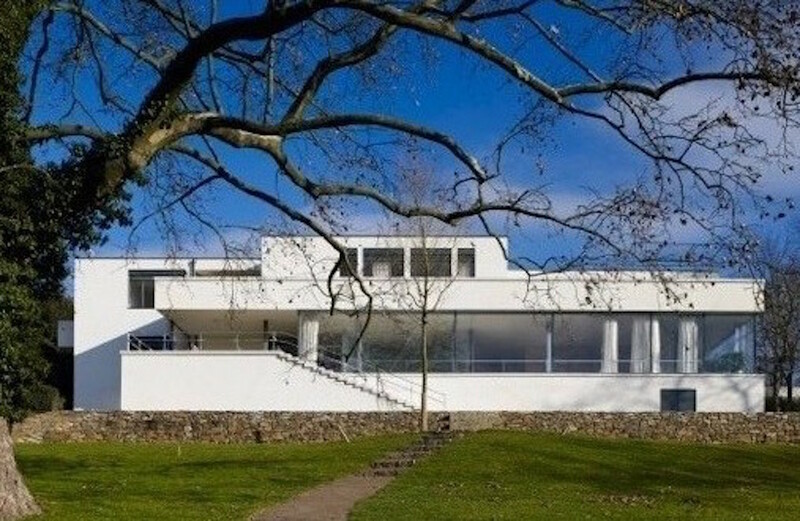 Built for a couple of well-connected industrialists with bucket loads of Czech crowns, Tugendhat is a reminder that many of the manifestations of Modernism in the early 20th Century came from the downright wealthy, whatever the loftier aspirations of the architects. But, let’s be graceful and give thanks to the Tugendhats (Fritz and Grete) and their wads of cash, as their Villa is a sumptuous, magnificent jaw-dropper of a building, the only example of Modern architecture in the Czech Republic recorded on UNESCO’s List of World Cultural Heritage Sites. 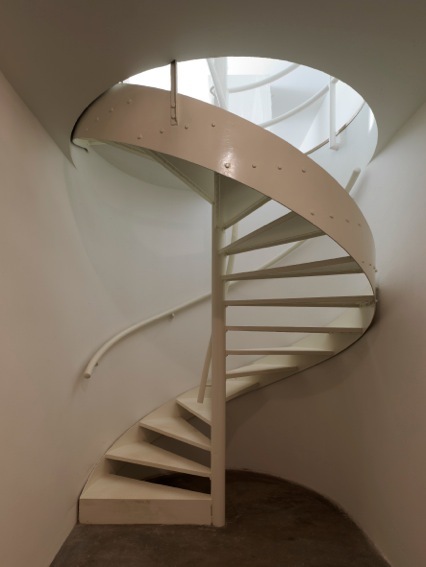 Fiona MacCarthy (biographer of Eric Gill), writes, “The strange and special atmosphere of Villa Tugendhat cannot be fully grasped from photographs. This is a building to be walked through.” And she’s right, still I will endeavour to give you a virtual tour. 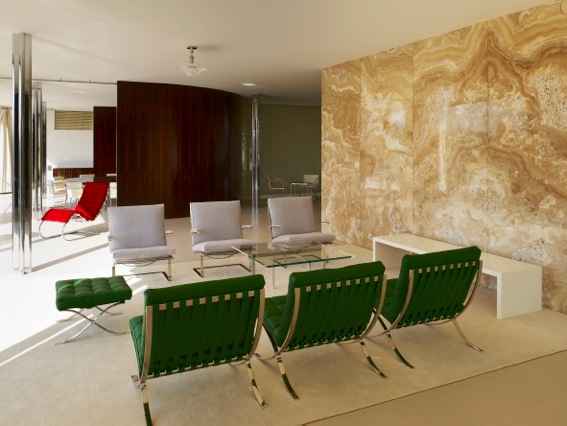 The house, or as Mies called his buildings “skin and bones”, backs onto a steep slope and approached from the road, looks like a low-slung, sleek bungalow, albeit an enormous one. That would be impressive enough in itself and may be all you see if you forget to book the viewing a few months in advance, but the building grows down the slope, tripling in height as it goes. You will enjoy views across the old town of Brno from a terrace and some enormous windows that wrap around a living room large enough to hold a couple of New York apartments on its own. 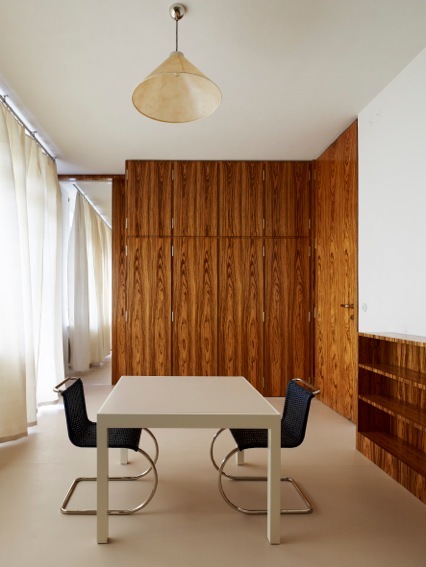 When the group we are with enter this room, there is a collection of gasps, laughs and murmurs that say more than the numerous text books written about Villa Tugendhat. It is at this point that you realise why Simon Mawer’s novel about this house is called The Glass Room. The huge (and fully automated) windows are enough in themselves to make one weep at the dark, pokey rooms so many of us endure. 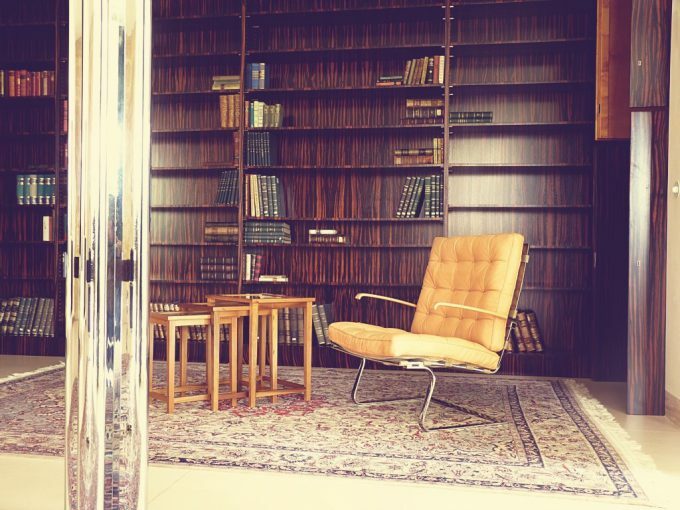 But then there is the onyx, the sweeping wood walls, shiny steel columns and furniture you would sell your most prized personal possessions for. There’s more, not least a sealed “moth room” for keeping one’s collection of fur coats away from the lepidopterous nibblers and a fascinating basement that lets one see the sheer scale required to keep this building operable but that would take a book (and there are plenty of those) to explain it all. 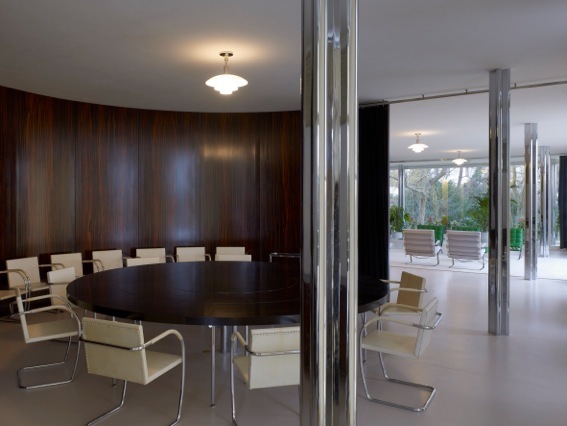 Villa Tugendhat underwent monumental renewal and restoration work over the years 2010–2012. Both the structure along with the adjoining garden were restored to their original appearance after the completion of the Villa in 1930. Both Nazi and Communist occupation had torn parts of the building up. Ransacked and left to ruin everything was painstakingly recreated. The interiors are now even equipped with exact replicas of the original furnishings. 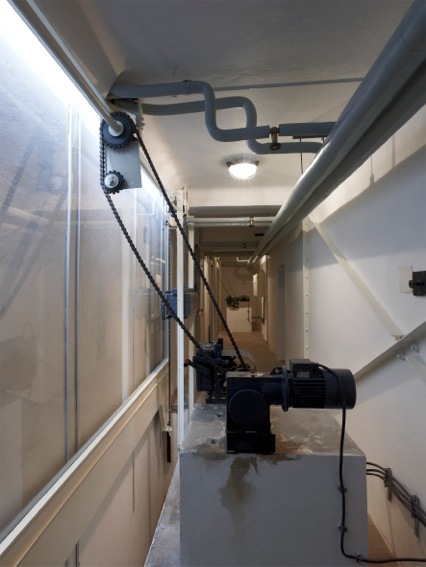 The technical equipment for the Villa (air technology rooms, boiler room and engine room for the retractable windows) was restored in the basement between 2010 and 2012 and is now part of the guided tours. Take in an exhibition too, presenting the architect, the owners and the family life in the Villa up to 1938 when the Tugendhats were forced to emigrate because of the threat posed by World War II. Follow Fiona’s advice, get over there and walk through. If you are lucky you will be plonked into a Czech language tour group as we were (all visits are booked in advance and in groups). That might sound perverse but the the main group will walk behind the tour guide, leaving us Anglophones more or less alone in each of the rooms. And so the taking of photos becomes a relaxing joyful experience and you are allowed space to imagine what it might feel like to live in such a vast, light building. 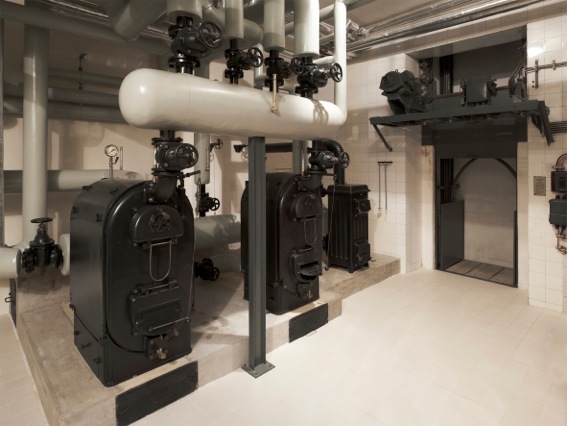 You could visit Brno and Villa Tugendhat as a short trip from a number of nearby places. Vienna is only a couple of hours away by train while Prague, Bratislava, Budapest and Krakow are about double that. 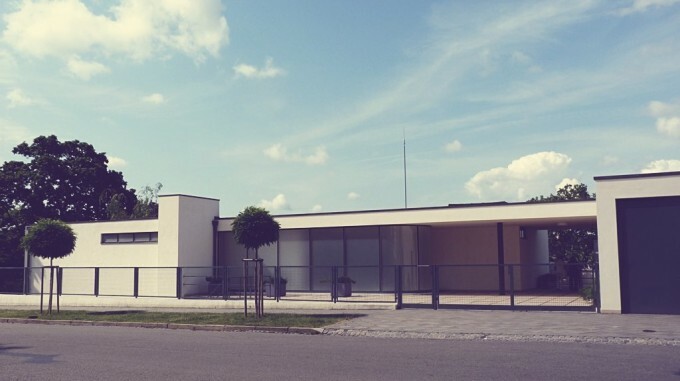 But that would be a shame, as there is a lot more to Brno than the Villa Tugendhat, wondrous though it is. Adolf Loos was born here and Brno, a little like Vienna, is an important part of the history of 20th Century architecture. 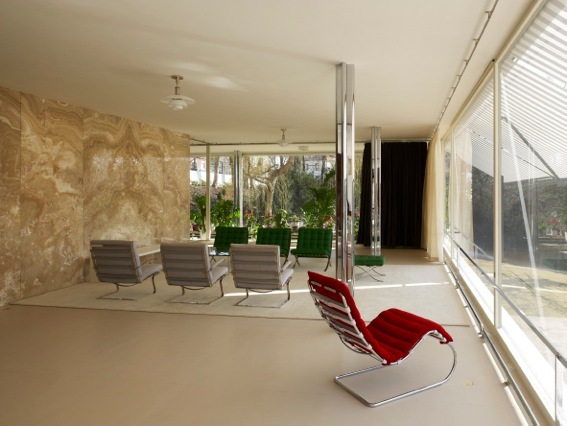 Even if you missed out Villa Tugendhat, there’s enough glass, steel and concrete to entertain the ardent Modernist. The people of Brno know it, too. The City even produces a guide to the city’s architectural history from 1918 to 1945. For around fifteen pounds you can buy the Brno Architecture Manual ( free online) which contains fourteen walking trails that take you past cafes, villas, schools, blocks of flats revealing delightful stories of novelty, hope and daring. Personal favourites include the Era Café just around the corner from Villa Tugendhat, a light and bright Bauhaus-style box with a curving staircase and an excellent rabbit stew. 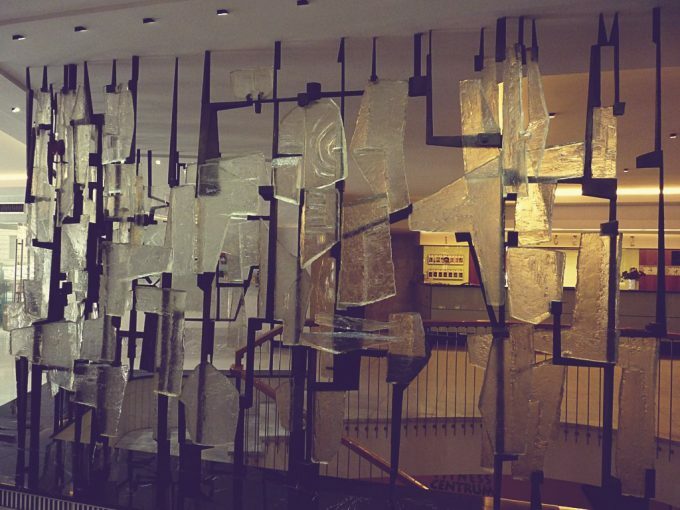 There’s the Googie-style exterior and the glass shard reception piece of the Best Western Hotel in the city centre. And the simple austerity of The Municipal Professional School for Women’s Occupations. Plus loads more. The BAM lists 383 objects of Modernist desire to look at so grab a travelcard, hop on a tram and see how many you can manage. In a couple of days we got to see around 50. And that’s without taking in the 1928 Exhibition centre, the middle-European Arts and Crafts Jurkovic house and, of course, all that really rather good Czech beer. Brno will be on your list because of Mies Van Der Rohe, and rightly so. Tugendhat is Brno’s cathedral but you can be sure there are many more places of worship here to make us ponder and wonder. 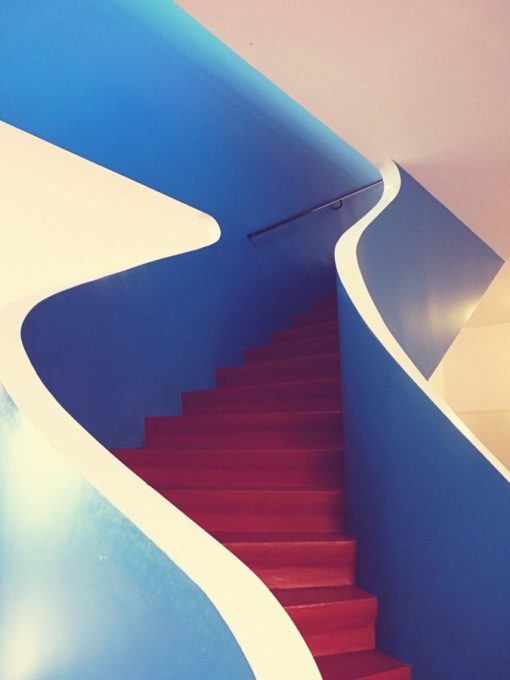 Start here – not a destination as such but a wonderful guide to all the modernist goodies. Get the book if you can. It all flows from here.